Real Madrid – Move. Run. Sports. Cristiano Ronaldo has completed his move from Real Madrid to Juventus at the age of 33. Showing that he has no plans of slowing down for the final stages of his playing career, signing a four year deal I very much think that means we will be seeing him in the next World Cup in 2022. That is a truly fantastic thought really, in his press conference he had a little dig at the players at this age who go to Qatar or China. So it is great to see this legendary player still actually wants to play at the very top level! The second leg of the Spanish Super Cup was always going to be more on edge than the first leg which took place on Sunday night. This game saw a red card for Marcelo in the last few minutes with a tackle on Cesc Fabregas, causing a brawl to break out. David Villa and Ozil were also shown red cards due to their part in the brawl, baring in mind both players had already been subbed off the pitch. 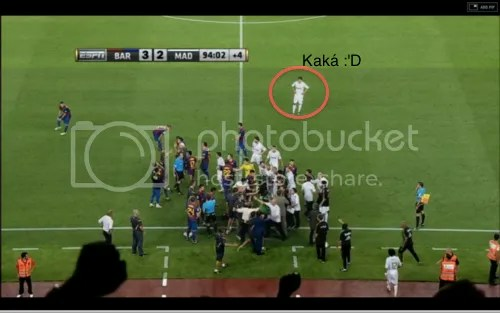 The only player who can keep his dignity after that is Brazilian Kaka who calming stood back and let them all go at it, brilliant to see!